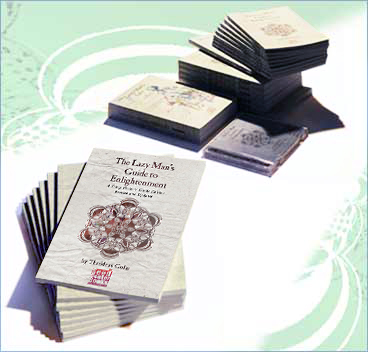 Thaddeus Golas reads The Lazy Man's Guide to Enlightenment for this tightly packaged Double Audio CD, which comes fully illustrated, and annotated. The Lazy Man's Guide to Enlightenment was first published in 1971. It almost immediately became the must-have philosophy book of its generation. The impact of "The Guide" elevated its author from a bit part in the Beat and Psychedelic movements to a lead role. The recording of this classic book, read by the author, is now available as a remastered, quality 2-disc CD. In this audio book, Golas updated his original text for a newer audience. He removed some of the outdated language. He also clarified numerous passages on the advice of his many readers. 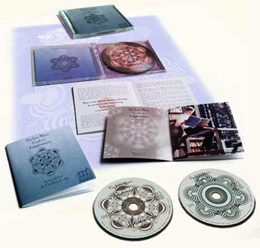 The 22 page color booklet in this deluxe CD package highlights Golas' own updates and revisions. All told, the recording is a lovely testament, and a rare chance to hear Thaddeus Golas' voice preserved in this new stereo digital mix. Having the book read to you, by the author, is even lazier. 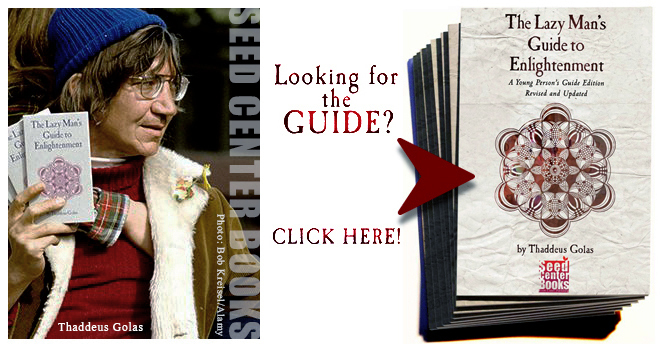 More publishing information about our products is available from our main website: SEED CENTER BOOKS. or to have your orders shipped anywhere in the World, including to Canada, please visit our International Sales Desk. to his fans all across the world! In 2010, a set of three previously unpublished books written by Thaddeus Golas was released by the newly reformed SEED CENTER BOOKS of Northern California. Love and Pain, The Cosmic Airdrome, and The Lazy Man's Life (The Golas autobiography). A follow-up to The Lazy Mans Guide to Enlightenment or perhaps a final revision to it. The Guide is still very significant to all those who sense the consciousness with which it was written but Thaddeus goes deeper with this new writing; he wanted leave behind a blueprint of his metaphysics that would withstand the test of time, beyond the euphoria of the '60s. He was, after all, a self-described hard-nosed critic of the many charlatans of the New Age; he didn't settle for benign therapies that passed for 'spirituality.' For all the comfort that an uplifting book can bring to our imagination, Thaddeus Golas wanted to write a text that he would like to find for himself, or give to a good friend; information that is solid, and that can be relied upon, even when the Universe fails to sustain all our fondly held beliefs about it. "I am a destroyer of ideas," he proposed, "and whatever I could not destroy is in Love and Pain." Love and Pain is a major work, intricate and subtle. It is an audit of our beliefs, and a wake-up call. It is also revolutionary! In time, it may come to be seen as one of the most important metaphysical books ever written; it is sure, at the very least, to illicit strong reactions from readers. The original Guide is here; copies are still available! discover this classic edition of the Guide, updated by the author, with 3 new chapters: "Expand", "Free Will," and "Who's on first?" The Cosmic Airdrome is a book of aphorisms and wisdom that you can open anywhere, to any page. It is a perfect companion to the Guide. Thaddeus Golas collected his thoughts and diary entries over a period of twenty years. The cream of these philosophical gems, compact ideas, and graceful metaphors, is collected in one elegant volume that can work as a Rosetta Stone to many of Thaddeus Golas' ideas and visions as first delivered in The Lazy Mans Guide to Enlightenment. The Cosmic Airdrome is a pocket companion, and friend. Thaddeus' autobiography is pulled from his diaries, emails and letters -- it is the account of his life, in his own words. The Lazy Man's Life is not a book of metaphysics, but at 540 pages (complete with a 16-page leaflet of era color photographs) it covers much of the story of the journey from the Great Depression to the psychedelic '60s. It is a historical account of the birth of the philosophy movement in America; a parade of the era's greatest players: Timothy Leary, Baba Ram Dass, Steven Gaskin, Allen Ginsberg, and all the rest. It features original poems by Thaddeus Golas, as well as a behind-the-scenes look at the creation of The Lazy Mans Guide to Enlightenment, and some definitive answers to the questions: "Was the book channeled?" and "was Thaddeus Golas a mere typist for higher consciousness?" The Lazy Man's Life will leave you feeling like an expert on the psychedelic and metaphysical '60s. For more information about our products, and about Thaddeus Golas, please visit The SEED CENTER BOOKS Website.